In the rich, warm colors of autumn, here's a slice of American history as we watch Anna and her extended family help with the town's traditional fall apple harvest. In the rich, warm colors of autumn, here's a slice of American history as we watch Anna and her extended family help with the town's traditional fall apple harvest. Now available in paperback. "This quiet story is a celebration of family and community...a good picture of how kids help bring in the harvest"(School Library Journal). "Ray's artwork gives the book strong visual appeal. 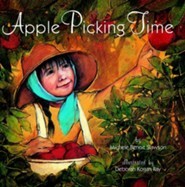 The orchard seems suffused with golden light and the children's faces are as round as the apples they pick" (Booklist). I'm the author/artist and I want to review Apple Picking Time.